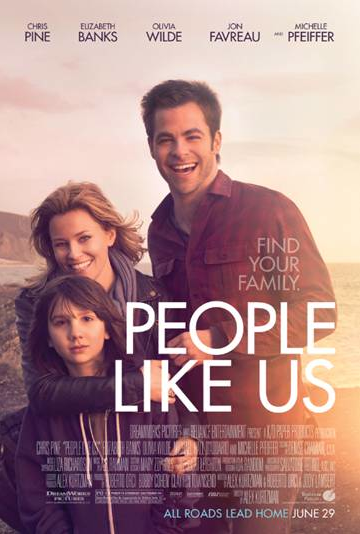 This past Tuesday night we went to a screening of People Like Us starring Chris Pine, Elizabeth Banks, Olivia Wilde, and Michelle Pfeiffer. Sometimes there are movies that entertain only and sometimes there are movies that sit in your heart and mind and stir around for days and days – maybe even longer. People Like Us is in that second category. Seems pretty predictable, no? Here’s the truth: yes AND no. In fact, right before the movie started one of my girls asked if my husband was going to write a review as well. I looked at her and said, “If he really likes the movie he will write a review of it, even though he doesn’t have to.” He grinned and we both knew he probably wouldn’t end up writing a review. Two hours later I looked at him again and I knew: I knew he WOULD be writing a review. Craig summed up the redemptive quality behind People Like Us in a way I only wish I could. Really, go read his review. And my quick caveat: This is a PG-13 movie and it has definitely earned that rating. I can usually tolerate a handful of “language” in movies when it makes sense in the context of the story. This one overdid it a bit and I don’t recommend taking kids to this for that reason alone. There is also a very brief sexual scene I quickly turned and covered up my kids’ eyes on too. Just wanted to warn you out there, but the PG-13 tag should be heeded in this case. Those things aside, if you are looking for good story-telling and a predictable, yet not annoyingly so, plot, add People Like Us to your list of movies to watch. And think about. We received free movie tickets for the purpose of review. All thoughts are my own. I agree completely. We were glad that we had decided to not take my daughter to the first screener we saw. The movie was not 100% complete and there was even MORE swearing in that earlier version it seems. It was a goo movie, just not a family-friendly film so to say.